Advocate: Trump’s New Muslim Travel Ban Will Be as Unlawful as First Executive Order | Democracy Now! executive director of the National Immigration Law Center. President Trump is expected to issue a new executive order temporarily banning all refugees, as well as people from six majority-Muslim countries, from entering the United States. The New York Times reports the new ban would apply to people from Syria, Sudan, Iran, Somalia, Libya and Yemen, but not people from Iraq. Iraqis were included in Trump’s first Muslim travel ban, which was blocked by the courts in February amid massive nationwide protests. Unlike the first ban, the new executive order is also not expected to apply to people from these countries with green cards or who already have a visa. AMY GOODMAN: —and green card holders will be allowed to stay in the United States? MARIELENA HINCAPIÉ: Sure. Thanks, Amy. Yes, we are hearing that the Muslim 2.0 ban might be released as early as noon Eastern time. We expect that—you know, what the administration has said is that they’ve tweaked it. We do understand that they are removing Iraq from it. Any level of tweaking is not going to fix the constitutional challenges that this executive order has. As you mentioned, we—the National Immigration Law Center, along with the International Refugee Assistance Project, the Yale Law School clinic and the ACLU, filed the first lawsuit on behalf of Mr. Darweesh and Mr. Alshawi, two Iraqi refugees that were detained at JFK, as well as everyone else that was similarly situated around the country. And that was the first legal victory that immigrants and refugees had against this administration, when, that Saturday night, a federal judge in the Eastern District of New York ordered the federal government to not detain or deport any of these individuals that had been in transit, that had arrived. We’ve separately filed a lawsuit in Maryland challenging the entire executive order. And then, as you know, the state of Washington has also filed. And there are a number of other lawsuits. All of these cases are somewhat on hold until we see the text of the revised Muslim ban. 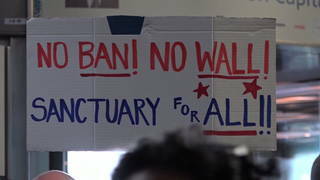 But frankly, again, we expect that it will be equally unlawful, un-American and unconstitutional. JUAN GONZÁLEZ: And, Marielena, I wanted to ask you about the news we reported this morning, that’s come out recently, that there’s a class action lawsuit by inmates who have been held in detention center because of the wages that they are being paid, some forced to work for a dollar a day or nothing at all. MARIELENA HINCAPIÉ: I just lost audio. AMY GOODMAN: Well, we will certainly pursue that issue in the coming days, this lawsuit that was first filed in 2014, immigrants saying they were forced to engage in slave labor. Marielena Hincapié, we want to thank you for being with us, executive director of the National Immigration Law Center. When we come back, we go to a family whose father was driving his 13-year-old to school, and he was ripped away by ICE. We’ll play some of the video and get response from the family and the family’s lawyer. Stay with us.